Extended testing of select 2016 salmon samples has identified the Fukushima-fingerprint isotope in one sample re-measured. 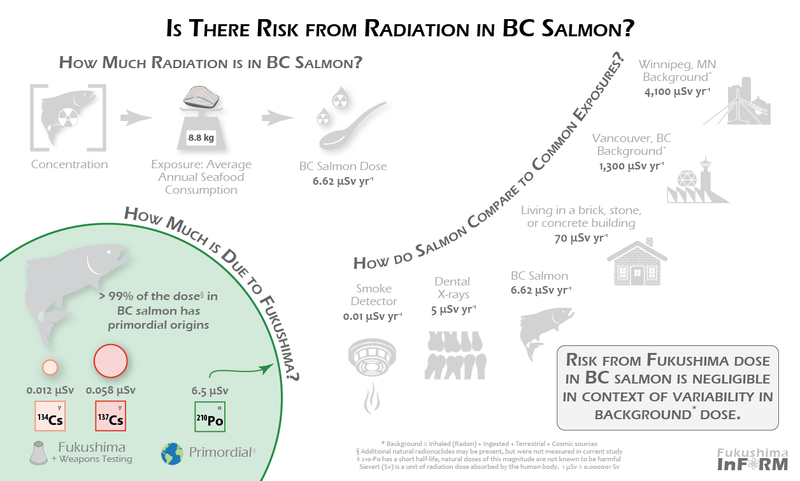 The maximum level of contamination observed in a sample (134Cs: 0.07 Bq kg-1, 137Cs: 0.51 Bq kg-1) is over 1,700 times lower than the Health Canada Action Level (1,000 Bq kg-1) and is not known to be a health risk for either humans or the environment. This was the second time that InFORM has detected 134Cs out of nearly 400 salmon sampled to date. Read the full report. Last fall, 90 salmon were sampled from hatcheries and donated from our First Nations partners around BC and Yukon. These samples are currently undergoing testing and we anticipate results to be available later this winter or early spring. Shellfish sampling also continued from ten aquaculture and traditional harvest locations in 2017. These samples will be processed when the analyses on the salmon are complete. Data from August 2016 research cruises show that the highest concentrations of the Fukushima contamination plume remain offshore. Peak concentrations of 6.3 Bq m-3 were measured along Line P nearly 1000 km due west of Vancouver. These concentrations are double what was concurrently measured in coastal waters. Further out, towards Station Papa at 50 N 145 W, concentrations are lower which indicates the the center of the Alaska Gyre and outside of the main flow from the North Pacific Current. Based on a comparison of the peak concentrations sampled along Line P between August 2015 (9.3 Bq m-3), February 2016 (7.2 Bq m-3), and now August 2016 (6.3 Bq m-3) we see a decreasing trend. This trend indicates that peak signal from the Fukushima plume as has passed through Line P and further observations are resolving the back side of the plume and/or possibly recirculation from the Alaska Gyre. Looking at the Alaskan end of the August 2016 dataset, data from stations in the Pacific near the Alaska Peninsula showed increased 137Cs concentrations compared to the central Gulf of Alaska. This is to be expected given the trajectory of the Alaska Current and its concentration into the Alaska Stream. The samples from the southern Bering Sea also show that trace concentrations of Fukushima contamination are present there as well, indicating that low levels have been sucked into the Alaskan Coastal Current and the Bering Slope Current. On the west coast end of the lines, we note that the area of peak plume concentrations (>5 Bq m-3) has decreased, yet remains offshore. 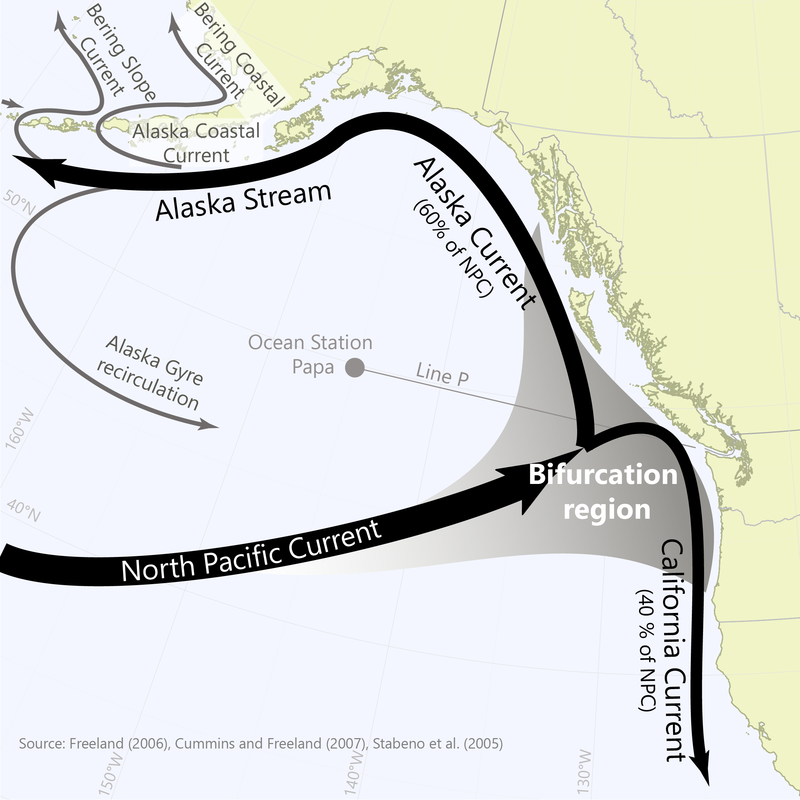 These observations are consistent with model predictions of the flow and reflect the slow mixing processes in the bifurcation region where the North Pacific Current splits into the Alaska and California Currents. Samples were collected aboard research cruises along Line P and aboard the CCGS Laurier during it’s transit from Victoria, BC to Utqigvik (formerly Barrow), AK, by way of Dutch Harbor, AK in August 2016. Line P is the longest running collection of oceanic monitoring stations visited regularly since 1956. Currently, these stations are visited each February, June, and August during multi-week research cruises. The CCGS Sir Wilfred Laurier makes the transit to the Arctic each year as part of it’s regular patrol and navigational buoy maintenance missions. Recently, the Laurier has also served as a platform for the Bering Sea Project, a long term monitoring program with collaborations between Canadian and American scientists. Rick Nelson, research assistant to Dr. John Smith, will be collecting new cesium samples next during the August 2018 cruise. All InFORM coastal monitoring data (Oct 2014 – July 2017). The upward trend in 137Cs concentrations in coastal waters continues according to five months of additional citizen science monitoring data which have just been added to our database. These results show the average 137Cs concentration along the coast of British Columbia to be 2.5 Bq m-3 with the highest concentration of 4.2 Bq m-3 sampled from Winter Harbour in July 2017. While the trend is very clearly still upward, recall that the maximum concentration observed offshore the prior summer was 6.3 Bq m-3. This should be considered a conservative upper limit for what levels may be reached along the coast since peak concentrations observed along Line P are decreasing, indicating the highest concentrations have passed. Concentrations of this level are well below the 10,000 Bq m-3 action level as set by Health Canada and the International Commission on Radiological Protection. We are often asked how we can be confident that our observations are representative of the peak concentrations likely to come from Fukushima since, after all, radiation is still leaking into the ocean daily. It is very true that elevated radiation concentrations are measured in the waters of Fukushima port, but current conditions (~300-900 Bq m-3) are far, FAR below the peak concentrations (~70,000,000 Bq m-3) that were observed in April 2011 following the explosions at the nuclear power plant. TEPCO monitors the conditions in the Fukushima port with a sensor that reports data every 10 minutes online (note the units: 1000 Bq L-1 = 1 Bq m-3). This relatively little flow of radiation mixes with the surrounding ocean and is challenging to detect off the coast of Japan, much less across the Pacific. The entire suite of observations since 2011 makes us confident in our conclusion radiation levels will not reach those known to pose a significant risk to either humans or ecological health. While the peak of the signal has now been observed, we continue our monitoring efforts because these data continue to illuminate rates of water transport and mixing in the coastal and near-shore environment. Using concentrations of 137Cs as a tracer for the water mass, we are learning how “The Blob” reduced mixing in the upper NE Pacific, how the North Pacific Current bifurcation zone buffers the coast, and how the regions of the BC coast are affected pulses of oceanic origin. As the plume continues to flush through the system we will improve our estimates of the flushing, or residence, time for waters in these locations. We know it has been too long since we’ve given you an update on progress. Samples have continued rolling into the lab each month from across BC, but the flow of analyses were interrupted when we suddenly lost our friend and colleague, Dr. Jack Cornett in early October. Now that the team he left behind at the University of Ottawa has reorganized around his projects, InFORM results should flow more smoothly, once again. We will make every effort to make up lost time, however we are limited by the analysis time (~24 hours per sample) required in our only gamma spectrometer. Thank you for your continued support of the InFORM project.